Archie Sam has been racked with back pain for several years, the result of two accidents − one at work and one while driving − that he says put him on life support twice. But Mr. Sam, a member of the Sto:lo Nation, hasn’t been interested in pharmaceutical pain remedies. He worries pills would mess with his mind and body. He is, however, interested in the Chinese acupuncture clinic that opened earlier this month on his home reserve. “My doctor told me that I would have pain further down the road and it would be excruciating,” said Mr. Sam, who noted he is not on any medication at all for the pain. He once relied on alcohol, but now avoids that. “What I am looking for is natural medicine, such as herbs from the land,” said Mr. Sam, who says the opening of a traditional Chinese medicine clinic in his community on Seabird Island is something that he can relate to. Dr. Michael Chung, left, Dr. Jackie Wu provide acupuncture treatment to Seabird Island First Nation member Brian Govereu. The clinic began offering services earlier this month every other Wednesday on the reserve. Seabird Island is one of more than 10 First Nations communities in British Columbia, including Sumas in Abbotsford, where Chinese-medicine doctors have offered help. A pilot project, launched by the Tzu Chi Foundation Canada, Snuneymuxw First Nation and Simon Fraser University, aims to do similar things for other Indigenous communities searching for health-care alternatives. Racheal Eni, acupuncturist at Snuneymuxw Health Centre on Vancouver Island, said she usually treats about 12 to 13 patients a day and her service is always fully booked. She said traditional Chinese medicine − or TCM − is a comfortable fit for many Indigenous patients because communities have a cultural inclination to pay attention to natural food and natural medicines. “For First Nations, the health issues are quite complex and chronic that people have issues that arrive from poverty, marginalization and colonization,” she said. SFU health-science professor John O’Neil has been studying aboriginal health for more than three decades. He said Western medicine hasn’t responded well toward many health issues in Indigenous communities such as chronic diseases and extraordinary levels of stress and pain. The opioid crisis has only added to the turmoil within the Indigenous population as people have gotten used to prescription medication to deal with pain. “There is a significant need in the First Nations communities for any kind of health care response that is useful,” said Prof. O’Neil. Michael Chung, chief governor of Tzu Chi International Medical Association, said the foundation first connected with people from First Nations communities in 2014. By then, he noted, they were treating homeless mothers with children at Vancouver’s Aboriginal Mother Center. After receiving positive feedback from the community, the organization thought their services might be welcomed by other bands. Prof. O’Neil said he has received lots of testimonial evidence indicating that TCM has a very positive impact on First Nations communities, but he noted there is still a lack of clinical evaluations and solid scientific evidence. He added that it would require a very expensive and lengthy study to provide solid scientifically valid clinical evidence, and no one is willing to fund that type of study in Canada. Acupuncture and traditional Chinese medicine are not regulated nationwide in Canada. Currently, B.C. and Ontario regulate both TCM practitioners and acupuncturists. Alberta, Quebec and Newfoundland and Labrador regulate acupuncturists only. 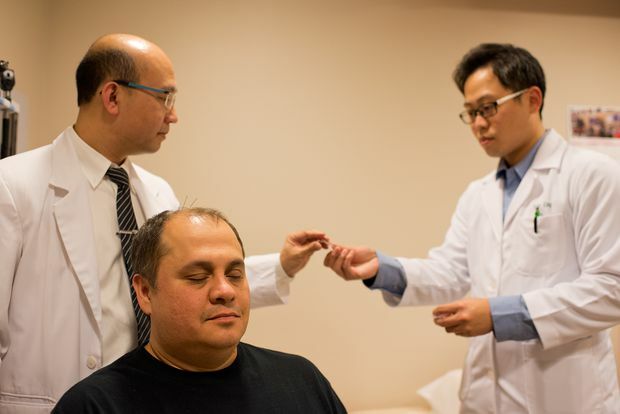 The Medical Service Plan of British Columbia now covers 10 acupuncture treatments per year, with other alternative care for certain low-income groups, and each service will be reimbursed $23. Dr. Chung noted that the foundation is also planning to work with several colleges in those Indigenous communities and establish TCM programs to train the young generation. He said the idea was partly inspired by some First Nations young people who received training with TCM, with a goal of serving their own communities. Karyn Smith, from Dzawada’enuxw First Nation in Kingcome Inlet, studied TCM at the International College of Traditional Chinese Medicine of Vancouver. After graduation, she served a few Indigenous communities in B.C. and now treats people in the Stó:lo First Nation in Chilliwack. She said both Indigenous traditional medicine and TCM see a person having a connection between their mind and body, and treat a whole person not just their symptoms. She added that the two traditional practices believe people should live in accordance with the environment and keep to a more local diet. Medicine, both cultures emphasize, are mostly found in plants that are around them. “I hope to bring it to more First Nations communities because I think it’s a really good fit,” said Smith.